We all know that Wal-Mart carries a large variety of skincare products and naturally as shoppers we tend to stick with brands that we have previously used and are comfortable with. Today, I am sharing info about Simple Sunrise products. Gentle products that are tough on makeup that you should try. 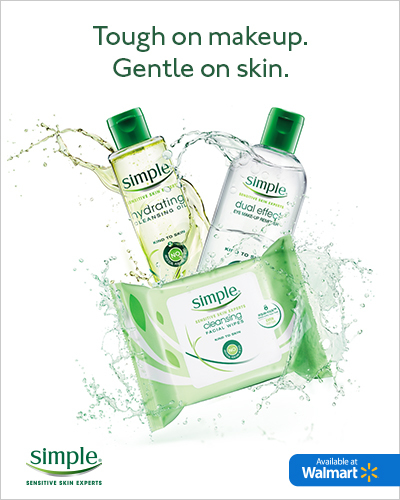 Walmart now carries Simple’s new formulas - Hydrating Cleansing Oil & Dual Effect Eye-Makeup Remover, gentle formulas to ensure makeup comes off cleanly. I am super busy and make up is a big part of my life, thats why I recommend these wipes, they take all the make up off of your face without leaving the streets of mascara or eyeliner. The beauty of Simple is while its cleaning your face, it i also hydrating and conditioning our skin.